Anise Yamamoto's father has warned her that if she removes her rose choker, she'll be cursed by a terrible punishment, which is why she always wears it even in defiance of her school's dress code. But when the choker mysteriously disappears, Anise is suddenly confronted with four Rose Knights, who insist that she's their sovereign. Oh, and they happen to be the four hottest boys at school. Most girls would think this a dream come true, but Anise can't help but wonder if having to put up with these guys is her punishment. It's been a while since I reviewed a manga, probably because it's been a while since I enjoyed one enough to finish it. Kiss of the Rose Princess is a very promising start to a series, with a great twist on a vampire romance storyline. 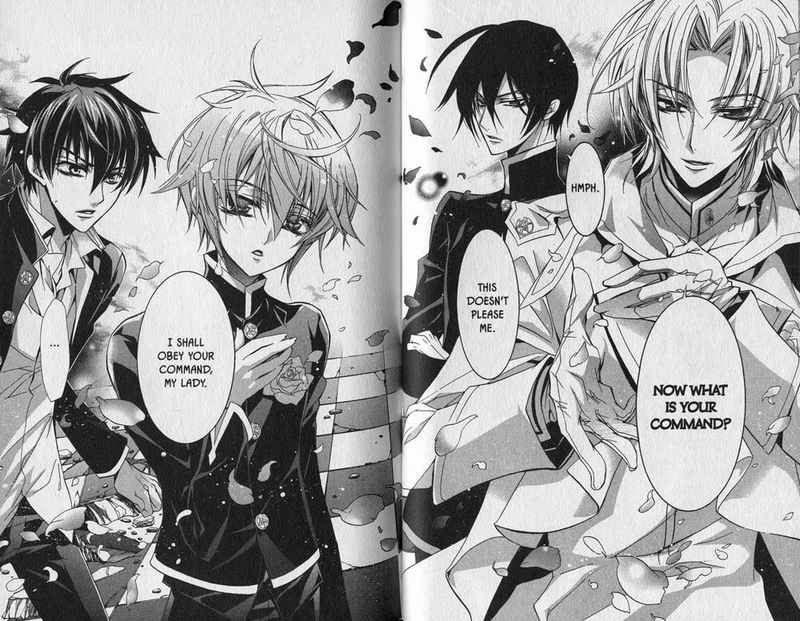 Essentially, the Rose Knights are vampires, in that they need to draw blood from Anise in order to wield their powers. At least one of them isn't human, although I'm not sure if that's true of all of them or not. My favorite of the Rose Knights is Kaede Higa, who's more or less a regular teenage boy. He and Anise are friends... of a sort. If you consider their constant bickering a form of friendship (I love it when the hero and heroine fight in romance novels, by the way). The other Rose Knights include Mitsuru Tenjo, the class president and most handsome and popular boy at school; Seiran Asagi, a gentle and sweet kid who has allergies (yup, roses... ironic); and Mutsuki Kurama, he of the non-humanness. He's also rumored to be an otaku, but I'm not exactly sure what that's supposed to mean in the context of this book. Whatever it is, it's not good. 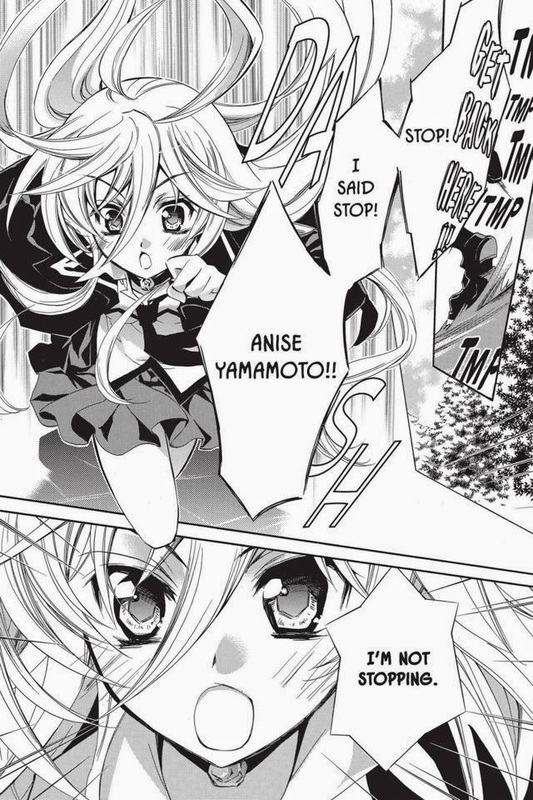 Anyway, Kiss of the Rose Princess feels surprisingly modern, mainly because of Anise. She's very independent, good at sports, not interested in putting up with any of Kaede's crap, and quick on the uptake that more penises mean mo' problems. She's not some beautiful and passive princess type. As for the artwork, I sometimes find graphic novels a little headache inducing, and there are times when the visual storytelling could flow better and be less confusing. But overall it wasn't too bad. I really liked the title pages. Definitely a promising manga to keep an eye on! 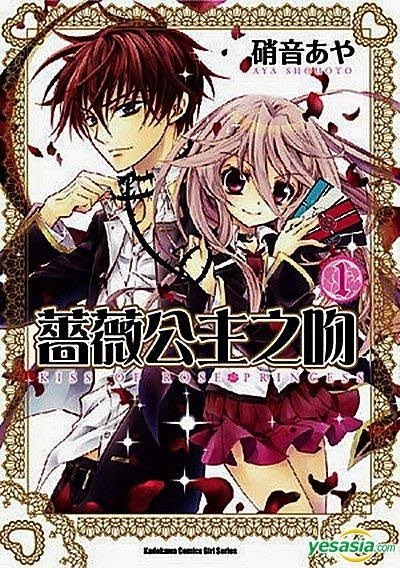 The second volume was only just published (in the US, anyway) and a third one is on the way in May, I believe, so it's early days yet, but I can see this series developing into something as addicting as Vampire Knight in future installments. Sunday Snapshot and Spring is Here!